1. Lightly oil a sturdy baking sheet and line with baking parchment. Place the sugar in a small, heavy-based saucepan with 100ml water and heat gently until the sugar has dissolved, stirring occasionally and very gently. Bring to the boil, then boil for about 10 minutes until the syrup has turned to a deep amber-coloured caramel. Don't let it get too dark or the flavour will be bitter. Remove from the heat and dip the base of the pan briefly in cold water to prevent further cooking. 2. Immediately stir in the peanuts and tip the mixture out onto the baking parchment. Spread a thin layer with the back of a spoon or palette knife and leave to harden. 3. Melt the chocolate, either in a heatproof bowl over a pan of gently simmering water, or in short bursts in the microwave. 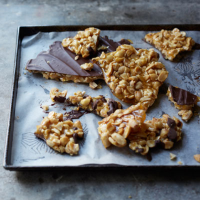 Invert the brittle on a clean sheet of baking parchment so the flat side is uppermost and spread with the chocolate using a palette knife. Leave to set before breaking into chunky pieces.